There’s a new technology on the horizon – a quite interesting one at that. This technology plans to remove the need to require passwords and replace them by simply with a phone being near the user’s body. The idea was suggested by Dennis Woodside, Motorola’s chief executive, at California’s D11 Conference on May 30, 2103. The tattoos were developed by MC10, an engineering firm in based in Massachusetts. The tattoos contain flexible electronic circuits that are attached to the user’s skin using a rubber stamp. Nokia has previously experimented with this, but Regina Dugan, Motorola’s senior vice president of advance research was a former head of the US Pentagon’s Defense Advanced Research Projects Agency. The agency demonstrated the silicon-based technology that uses the bendable electronic circuits. It was initially designed for medical purposes, but Motorola is hoping for success with these “Biostamps” for consumer authentication purposes. Motorola’s has the notable expert on their team to get the pan implemented quicker than other companies. Motorola is also investigating the Proteus Digital Health Pill, which is a computer chip that is powered by a battery using the acid in the user’s stomach. This was already approved by the US Food and Drug Administration and was given approval by European regulatory in 2010. The pill creates a unique signal that gets picked up by devices outside the body, which could be used to verify a user’s identity. It’s been claimed that the pill can be taken daily for about a month. Motorola has already begun to enter the smartphone realm by preparing to launch the Moto X Phone in October. It will go on sale for much less than the iPhone and other smartphones in the market now. Motorola is behind but it just can’t simply compete by selling the same phone everybody else is selling at a cheaper price. It needs to exceed expectations and issue a technology that surpasses that of its competitors. Although many people will be creeped-out by this, I think that it’s not only fascinating but that it can revolutionize the industry. I agree with the former Google employee; it is very irritating to have to log in with a password over 50 times a day. I am in fact so irritated that I do not have a password on my iPhone or iPad. Although some may believe that is a security issue, I make sure I have the devices either near me or in a locked area. The minute I discover my phone is in danger I quickly find a computer and lock it and erase its data. But that’s beside the point; it is a pain to go through authentication constantly. I think the idea needs much work and warming up to, but I think it’s fantastic. We already have very technologically advanced biometric systems in motion, so why don’t we get consumers to start using them to their benefit as well? How do you think the company Motorola will do? What do think of this idea? Are there safety issues? Would you be willing to try it out? Fellow college students just like us had an idea that had the potential to turn into millions. 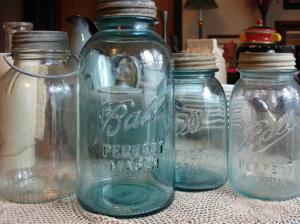 The Mason jar has been popular among people and restaurants for use as a drinking glass. But what about a cocktail shaker? When college friends Eric Prum and Joshua Williams were playing around with a Mason jar last year, and transformed into a hip new cocktail shaker, they had no idea it would turn into such a hit. Their Mason Shaker idea was made with a Ball Mason jar and fitted with a custom lid representing the same structure as a cocktail shaker lid. Last November, the initial order of the shakers were introduced at West Elm stores and thousands were sold out with in just three weeks. In January, the sales of the shakers through the Internet and the West Elm stores had reached $250,000. In January last year, these college buddies first came up with the Mason shaker and designed it. Later in that following July, they came across this crowd-funding website called Kickstarter. This site helps raise money for start-up businesses. Their goal was to raise $5,000 to help manufacture and supply their product. They shattered their goal of $5,000 by raising $74,738 from approximately 2,000 investors in as little as a month. This was not the students’ first entrepreneurial engagement. Williams, who had a passion for food and drinks, started a catering and cocktails business with his fellow friend Prum. During the company’s events they discovered how useful these jars worked well for creating their unique cocktail concoctions. Previously, Prum was a designer and developer for a paintball company, so he took the knowledge gain from this experience and thought to design something with his best friend – a cocktail shaker. These friends took their product design skills and knowledge to refine their Mason jar cocktail shaker invention. Making over hundreds of tweaks and finally happy with the final prototype, they began their business. Prum and Williams founded the W&P Design, a Brooklyn-based product design company. Then they launched the Mason jar shaker on Kickstarter. Prum was working as a full-time managing partner, while Williams still employed in his banking job, working as an adviser on product development and business strategy – 2 important operations management tasks. Then they launched their product by a good deal with a home goods chain called West Elm. The company is already profitable, but it’s still very much in startup mode. They are both hoping that through their skills and knowledge, they will achieve longevity in their business. I believe these students turned a simple idea into a creative invention that became popular and profitable, but it maintained its profitability and exceeded it through knowledgeable decisions on operating their business. Prum and Williams, a pair of wise college students made very intelligent and correct operations decisions in their start-up business to not only reach goals, but exceed them. Their Mason jar shaker was a success and their future decisions will continue to show how successful the shaker can be and how their business will progress.